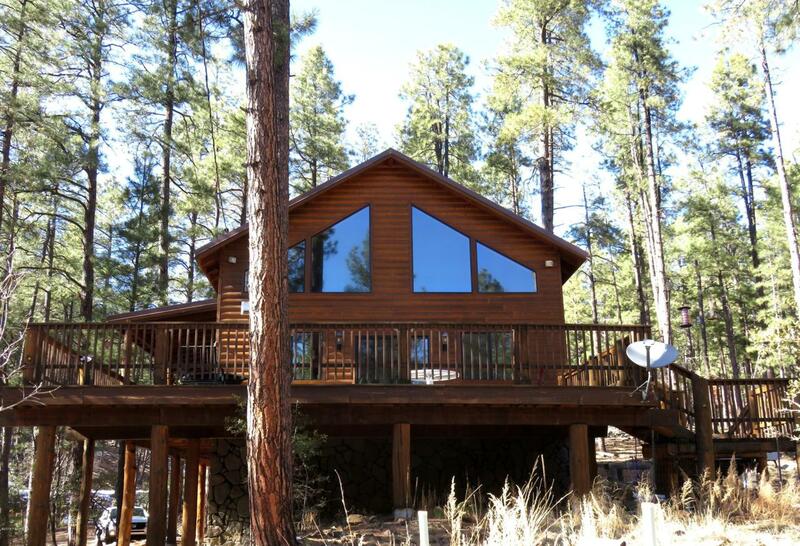 Beautiful log-sided/stone cabin with metal roof along seasonal creek on 3.57 acres in the tall pines. Year 'round access and only a short distance off paved Walker Rd. Cabin is apx 2100sf with 3 bedrooms & 2 baths, great room with vaulted tongue & groove ceiling, wood-burning stove, lodge pole accents, and lots of windows for natural light and great forest views. Spacious kitchen with large island & dining area will accommodate all your friends and family. Loft and master suite with private deck are upstairs. 2 bedrooms + 3/4 bath/laundry are on main level. Central propane heat, 15+gpm private well, and Eljen septic system. Spacious open deck, as well as covered deck off main entrance. Fenced dog run, lots of flat parking area, and two-car attached garage with large storage area. Listing provided courtesy of Sharon Bencze of High Country Realty Llc.